Although spring is near, this post is not about baseball, but about all the old stuff in the sock and underwear drawer that never seems to get thrown away until after it has been sitting around for years. There’s no good reason for that—replacing socks and other small items of clothing is not that big of a chore, and it is nice to have new socks even if the old ones are not full of holes. Maybe the socks are neatly stacked up and not in the way, but that doesn’t mean they ought to stay there forever. The fabric gets more worn and stiff than we may notice because it happens gradually. Or it could just be a type of fabric that doesn’t wear well, like that awful crinkly synthetic that everything sticks to after one washing. 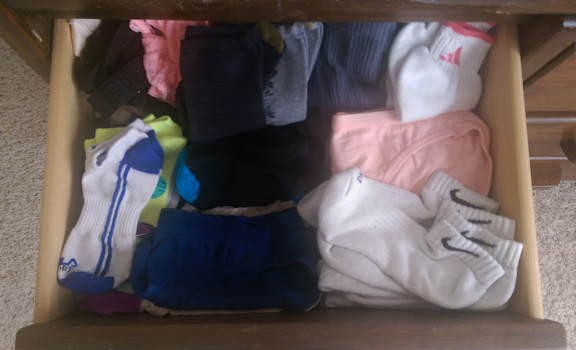 Early spring is a good time to purge the sock drawer and get a fresh start!